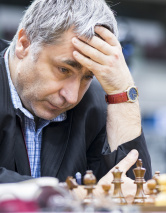 Vassily Ivanchuk is a Ukrainian Grandmaster and the 2016 World Rapid Chess Champion. He won the 1987 European Junior Chess Championship in Groningen. He was awarded Grandmaster in 1988 and was listed among the top 10 players in the world that same year. He has been ranked No. 2 three times (July 1991, July 1992, October 2007). At the age of 21, he won the Linares tournament where he played against 8 of the top 10 players in the world. In this competition, he defeated World Chess Champion Garry Kasparov in their head-to-head game. He was awarded the Order of the Prince Yaroslav the Wise IV degree by the President of Ukraine in 2011. In recent years, Ivanchuk has started playing checkers and has achieved a certain level of success. In the World Draughts Federation's January 2019 ranking list, he was ranked as number 1233 in the world.